How does this module work? 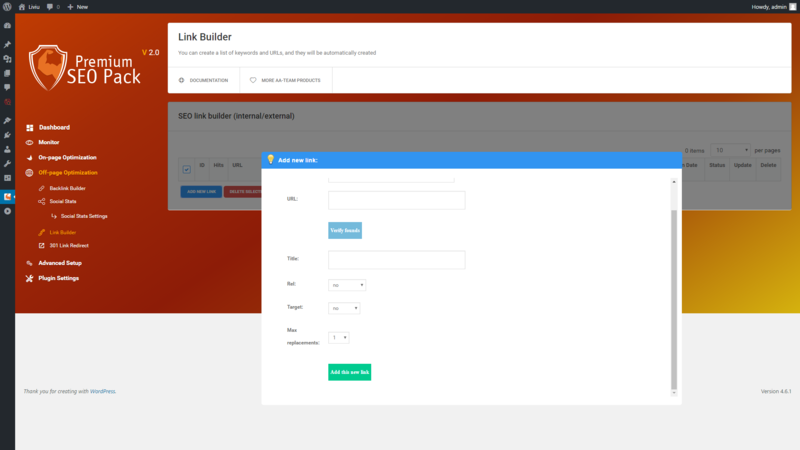 The Link Builder Module allows you to improve your site internal link building. You can create list of keywords and URLs, and they will automatically be created. You don’t have to bother to take each post and modify it, this module does that for you! All you have to do is to insert a keyword and a URL, and within all your articles the links will be published. It Improves the user’s experience around the website with internal links, It Improves SEO by spreading the link around your website and you can also create Links to sources or affiliate links whom you reference a lot. How do you add a new link? Simply Click on Add new Link button, and you will have the following options: Text, URL, Verify founds (if the text does not exist, no link will be added), rel, target and maximum replacements. You can set if want to publish/unpublish the link, update or delete.